It’s almost noon and two men clad in blue greasy overalls sit on a wooden stool chit-chatting on the prevailing economic situation. It’s just a typical discussion on a typical day in the poor suburb of Mbare, the crime capital of Harare. The residents here are retirees, working poor, drug addicts and people with mental illnesses, mostly those unable to keep pace with the spiraling cost of housing in Harare. Manenji Chikwekwete, owner of a small coffin making business tells his compatriot that the government has failed to address the bread and butter issues but unlike most Zimbabweans, he is happy that his business has remained and will forever remain intact, for as long as there are human being on the planet. “It’s been a very difficult journey, painful I would say. Nothing is certain in this country. You could wake up one night and raw materials will be twice as expensive as they were last night, that’s a big challenge for us,” he says. Before venturing into this business, Manenji was employed by some manufacturing company but was laid off and in his quest to find means of survival for his family of nine, which includes an extended family, he saw an “opportunity” in making coffins. “I saw an opportunity in this industry. What happens is, you locate a place where you know your business will thrive and establish yourself. My brother invited me to do this and I accepted the offer, I haven’t looked back since then,” says the father of four. 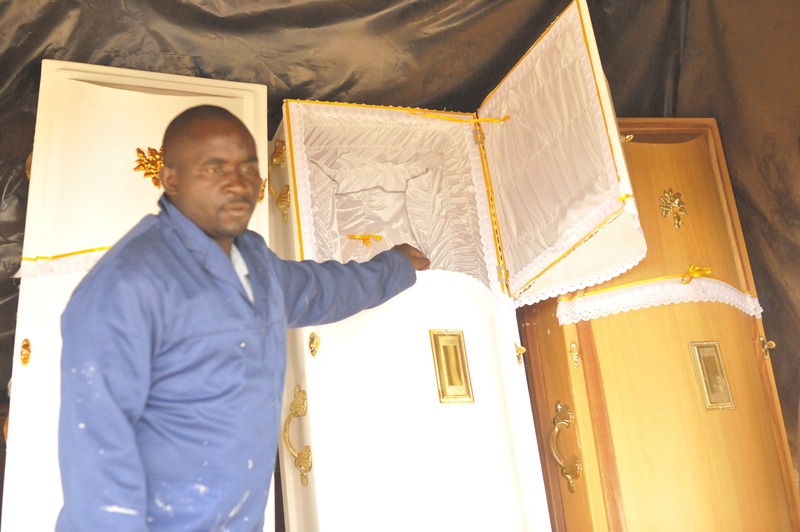 But with the economy on a downward trajectory, Manenji says he is grateful that he made a right choice to venture into the coffin making business as it is hardly directly affected since people will always die. “The good thing is that you hardly go broke in this business, it also does not rapidly grow, it most often than not, remains constant but one is able to eke a living. Whether things go terrible or not, I know there is stability in this business, people will die and we will make money,” he laughs it off. However, he adds, he does not celebrate in people’s death as he wishes people would live longer, but he is too aware that the less people die, the higher chances of him going broke. But it’s just business, life goes on. “Nature says people will always die but I do not wish for them to die, I want them to live longer but that is also affects my business so it’s a battle between morality and business,” he adds. With Mbare being one of the areas in Zimbabwe where service delivery is pathetic, the large part of the population lives in a health ticking bomb. Uncollected garbage, flowing raw sewer, unclean water and high levels of drug intake by unemployed youths pose a high health risk in the area and death the death is almost certainly guaranteed, and that is big business for Manenji and crew. With the lowest asking price of a very ordinary “budget” coffin going for $100 while the most expensive going for $350, it means Manenji is almost always guaranteed of a good fortune monthly. Manenji is well aware that it does not matter whether one is buried in a cheap wooden coffin or expensive white, gold handled and mirrored casket, because at the end of the day, all that matter is going six feet under. “Murombo munhu, haaivigirwe parupasa (a poor man is also a human being, he deserves a dignified burial, he should not be buried on a reed mate). We all want to see our relatives getting buried but for someone who is in business, I’m happier when my customers buy the most expensive one. It means at the end of the month, my family gas food on the table and that is my main mandate. “So at a time when most of you are crying, we remain stable, we know we will wake up tomorrow and someone will be buying a coffin. It all smiles my brother,” he says.